A hospitalist is a physician who specializes in treating hospitalized patients. At Upstate University Hospital Community Campus, hospitalists concentrate on the unique aspects of patient care during their stay. Hospitalists manage medical problems throughout your hospital admission, coordinating and consulting with specialists, closely monitoring your progress, and staying in close contact with you, your family and your primary care physician. Hospitalists at the Community Campus are available around the clock and are dedicated to providing safe, high quality care to you during your hospital stay. Professional 24-hour care by highly trained physicians experienced in the specialized area of inpatient hospital care. Prompt follow up of tests and adjustment of your treatment regimen throughout the day as needed. Intense focus on patient education. Convenient and timely access to hospitalist staff for medical treatment and family conferences. Member of the hospitalist team is available immediately in case of an emergency. What role will your primary care physician have during your hospital stay? 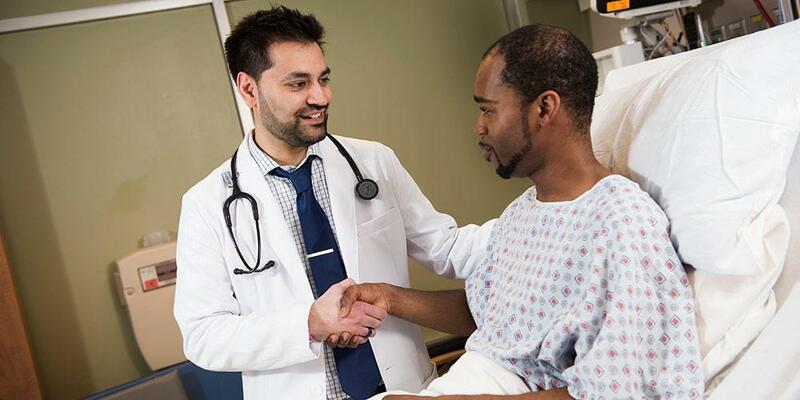 Your hospitalist knows that excellent communication is the key to providing quality care and will be in close contact with your primary care physician when you are admitted to the hospital, throughout your hospital stay as needed and again when you are discharged. Of course, your physician can also contact the hospitalist at anytime during your stay to learn about your progress. When you are discharged from the hospital, your primary care physician will resume management of your medical care. To continue your care with as little interruption as possible, our hospitalists will provide you with discharge instructions regarding medications, activity, and information about when to schedule a follow-up appointment with your primary care physician or other specialist. It is essential that you keep your follow up appointments made at the time of discharge. Additionally, to make this transition as smooth as possible, your primary care doctor will have direct access to all medical records from your hospitalization.